Hard Graft - 49 – Best. Interview. Ever. 49 – Best. Interview. Ever. Took the words out of my mouth. Wait, those were my words. Awesome. I’ll chat about the comic in a moment but first, I’d like to talk to you about something. Human Trafficking. Its something that you read online or watch on telly every day but do you really know the facts? For example, did you know that more people today endure slavery of one kind or another than during the trans-atlantic slave trade? Thats 27 million people. Did you also know that the majority of these people are women and children smuggled into Europe and North America to lead awful lives in prostitution and the grey market? But did you know that you could help stop this today? Well some of us have decided to do something about it. Monday, January 11th is National Human Trafficking Awareness Day. To participate, we formed the Comic Creator’s Alliance–a group of over eighty comic book creators (both web and print) who volunteered our artistic talents to raise money and awareness for this cause. Together we have each donated an original drawing of our own female characters, and combined them into a single wallpaper image. The wallpaper features characters from The Phoenix Requiem, Girls with Slingshots, Earthsong, Looking for Group, Shadowgirls, The Uniques and three IDW Publishing titles: Fallen Angel, The Dreamland Chronicles and The Dreamer, and lots, lots more! Donate today to download this unique, once-in-a-lifetime wallpaper. Just like Lincoln and Wilberforce before us we can stop modern slavery dead in its tracks. Lets make it happen. The Donations Drive will last for two weeks, from January 11th – 24th. All proceeds will be split evenly between Love146 and Gracehaven House- two organizations working on rehabilitation of victims and prevention of this crime. Anyway back to the comic. I would think this would be the best interview ever if the Boss allowed you to smack him in the face. Either Alan is very drunk (or punch drunk) or he just wants to see if Bernadette is the real deal. I’m probably going to side with the latter. 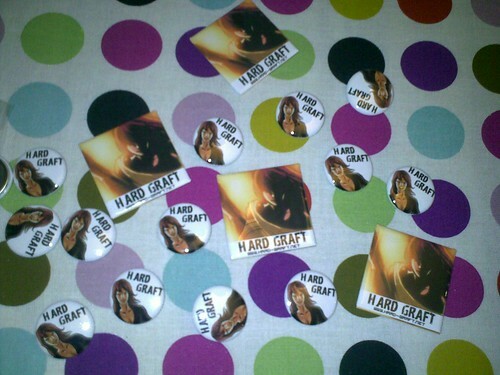 Its going to be the first anniversary of Hard-Graft next month so I might concoct a little competition or something to help celebrate!